Whilst sitting in the pouring rain, looking horribly like a smelly old tramp and trying not to laugh at the Umbrella-Wars developing between parents whose kids wanted to see the show and who were too tiny to see beyond the brollies, I got to wondering just *why* Danny The Champion Of The World has always been – by far – my favourite Roald Dahl book. 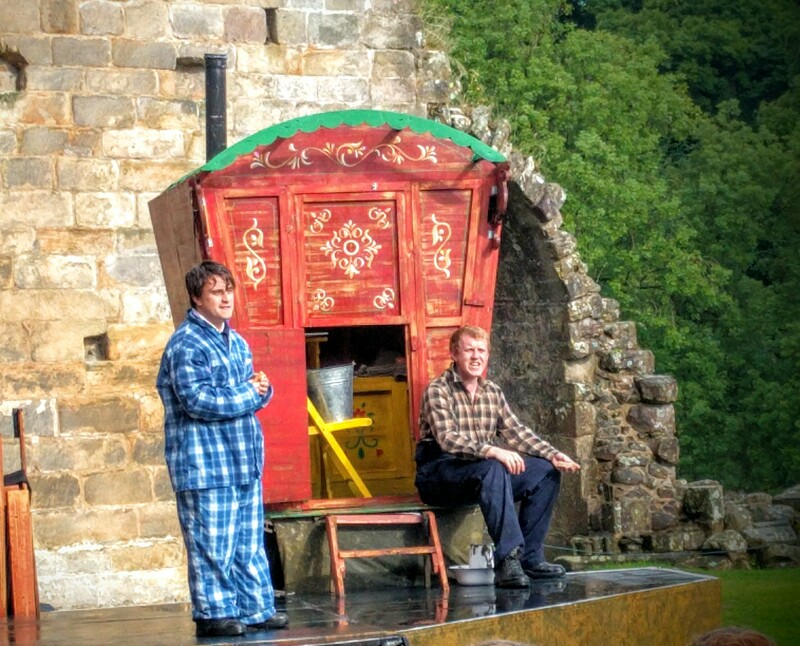 And why I was grateful to the Grassington Festival for bringing David Wood’s adaptation to Yorkshire. I first read it when I was 6 or 7. I’d read all of his other kiddy books before this one and I fell hook, line and sinker for Danny and his Pops. Why? At the time (the 70’s) it was rather unusual to hear the story of a little lad being brought up by a single parent. And even more rare for the parent to be a dad. A working class dad too – who loved his boy beyond belief, who fed him the most fantastic life as they lived in a gypsy caravan and existed on a diet of stories and experiments with nature and science. The thread behind the story of Danny is one of a continuous tale of insurrectionary behaviour. When Danny stumbles across his dad’s big secret – Dad is a Poacher – at first he experiences fear and shock. Dad could get arrested! Dad is breaking the law! And then we learn his father’s views. The main reason behind why his dad poaches on Victor Hazell’s land is because he totally, utterly, truly hates fat-cat landowners who blam-blam-blam the poor pheasants out of the skies (I mean, where’s the art-form in THAT? ); who treat poorer local people like scum and who are angling to buy up the rest of the surrounding property and lord it over everyone else with their posh parties. Plus it’s thrilling isn’t it? To be breaking a law… and also believing that you are doing this in order to comply with a higher code of morality. And yes, the fact that this little performance of Danny The Champion of the World was being held on the lands belong to the Duke of Devonshire which happens to be riddled with pheasants and come the autumn lots of shooting parties… didn’t entirely go over my head. But then that’s me for you. I like a bit of politics. The children watching the show however, were probably less interested in the socio-economic message than I was. 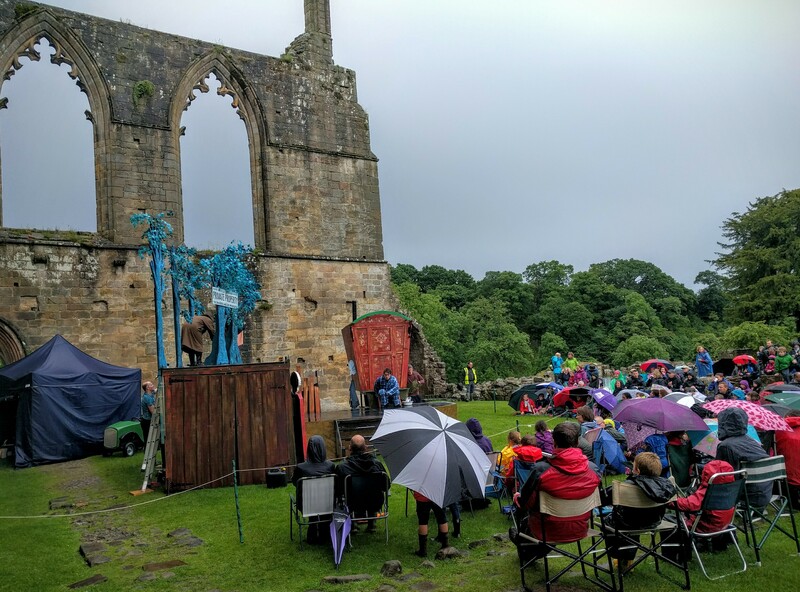 They were held spellbound – despite the on-off pummeling of the rain. 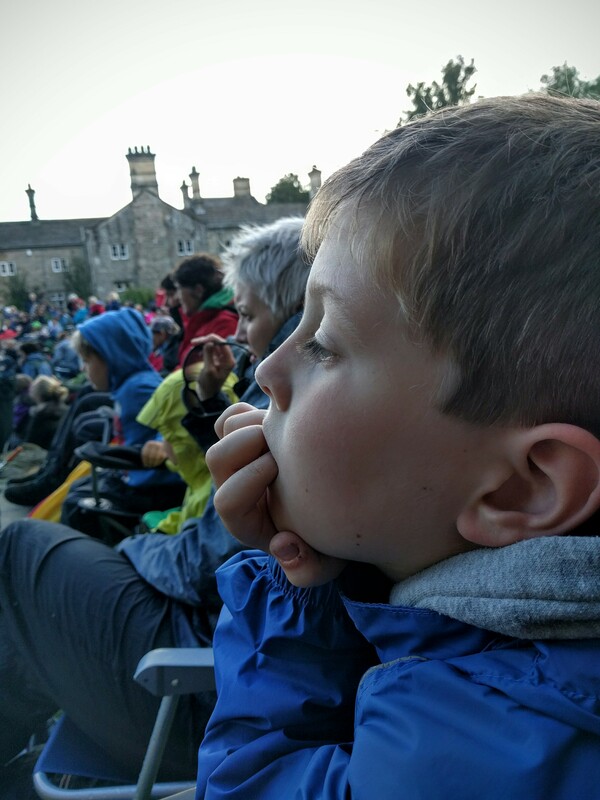 My 8 year old lad wanted to conduct a review of Illyria’s fine production for me and as the kid is easily bored by too much dialogue, I was surprised that such a wordy-based production completely kept his attention. For him, the gypsy caravan, the quality of the acting and the nasty Victor Hazell (the kid led the booing – and actually rather embarrassed me – by shouting out above all voices “you’re an evil old murdering nincompoop!” at the actor) accurately represented the Danny tale. All in all, you have to be a pretty special little theatre company to have adapted one of the best stories ever written, to deliver it to an audience ranging from 0 to 80 years, to do it in the middle of the driving rain and not to be fretting that one of the Duke’s henchmen would truck up in the middle of it and chuck you off his land for insurrectionary and not-so-subliminal messages. And Illyria more than pulled it off. And hopefully when you go to see it, this won’t be because of the rain. A recent CBI survey highlighted that 1 in 6 pupils struggle to read when they leave primary school and that for boys in particular – especially those from more disadvantaged backgrounds, reading rates are actually dropping. And the National Literacy Trust tells us that the gap has increased – between the proportion of girls (61.6%) and boys (47.2%) who say that they ‘enjoy reading’. And yet we live in one of the most well developed, most affluent nations in the world. So, what the hell is WRONG with us? 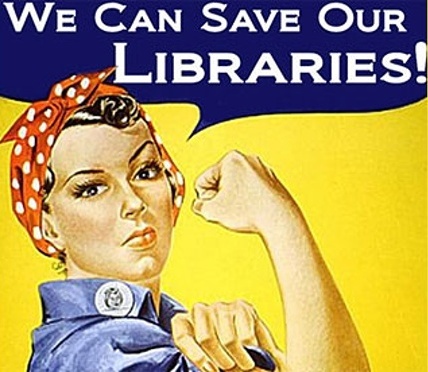 (Apart from the fact that we’re axing libraries – 201 public libraries were closed down as part of UK government cuts in 2011-12.) Now, I could spend the next several thousand words trying to persuade you of that I’ve been researching this issue to death, that I know precisely ALL of the reasons for this societal dismal failure, but I’m: a) not a well-paid journalist – or indeed, paid-at-all in order to preach to you and; b) I’m a hard pressed mother of two, who also tries to juggle several jobs, plus replacing the toilet roll AND continuing with my ongoing battle with our recalcitrant bin men. Meaning that I can only provide you with a smattering of speculation and my own recent observations on this issue. Previous posts on this blog have alluded to the fact that I was an early reader, that I had a Ma who encouraged me to sit with my nose in a book and that although I grew up in a pretty poor working class area of East Manchester, I was fortunate enough to live just a five minute wander from a local library, that babysat me for most days of the week (joke there, Ma – joke!) We also had a set of very exotic neighbours who influenced me with this peculiar reading habit. 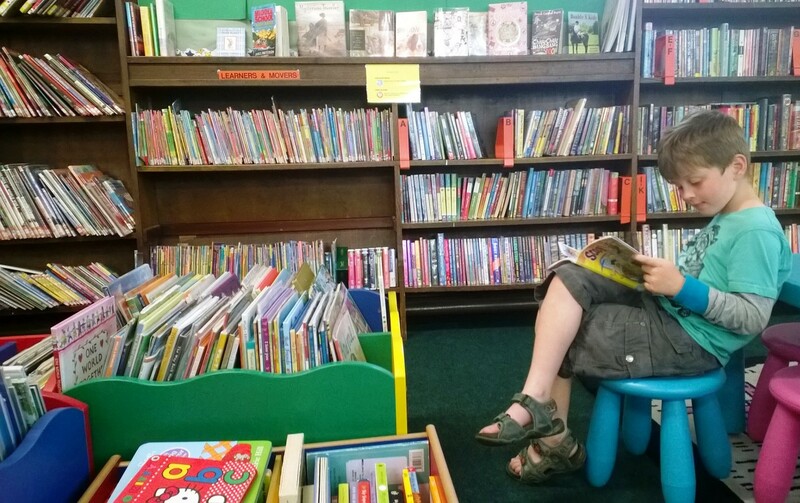 If Kirklees Libraries installed a loo in the corner of the children’s section – we might even move into the place. There were all very bohemian because their kids were allowed to read books at the dinner table … and even (even!) whilst the family bums were parked on the loo! Consequently, my dream as a small child was to grow up to become the kind of lady who had a bookcase next to the bog. 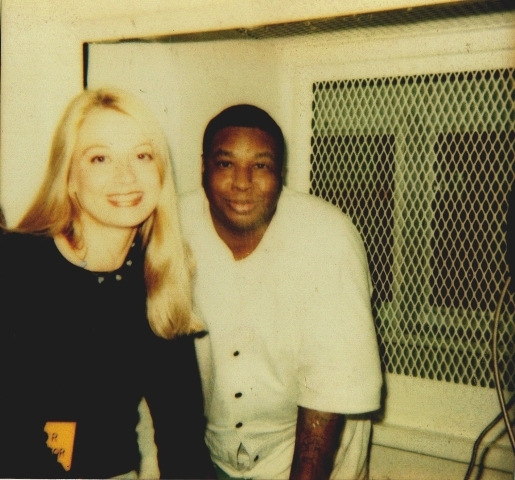 Me and our Ant, death row, Texas. The letter-writing provided me with a new mission in life – to either send books into prisons, or to furnish inmates with a long list of; ‘if you CAN – do try and get hold of this one …’ I’ve become sort of a nicer, fluffier version of Amazon’s ‘If You Like That – You Might Like This!’ pop-up box. And I don’t gain nowt from it, neither. Other than the warm gooey feeling of having helped a fellow human being. So yes, I have to confess that I had been enjoying the rather saintly feeling that hurling book choices towards other people involves. But as they say, pride comes before a fall. And the smug grin was wiped off my face when Child Number One arrived in my life. Because Child Number One did not want to sit and read a book. No. Child Number One would happily command you (and I don’t use that term lightly, but hell – the kid is scary) to read to her. For hours on end. But would she pick up a book and read it herself? Nah. In fact, she would hide her school books so that you couldn’t find them. And it wasn’t so much that Child Number One didn’t enjoy a ripping good story – no. I mean, now that she’s ten years old, she owns nearly 150 audio books (most of them pitched at the Young Adult or grown-up market – but don’t worry – I haven’t let her near Fifty Shades, just yet.) So how had this happened to me? How had I ended up with a kid – so similar to me in so many ways, but who would happily have carried out a ritual book-burning in our back yard, if I had mooted the idea? 2) INTRODUCING A BOOK – I’ve stopped chucking books at my daughter and expecting her to break the ice with it. It’s exhausting enough having dyslexia, without some smart-alec grown-up ladling on yet more expectations for you. Instead, I read the blurb out to her – in a very amusing and quite frankly, very annoying – ‘Hollywood Film Trailer Voice.’ And then I read most of the first chapter out loud to her too. And yes, if I’ve done my work well in terms of researching *the right book for her to begin with* (see ‘GO RETRO’), then the wee varmint, more often than not has been drawn into the story and has already overcome her initial reluctance to read. Many authors are nice. And they like you too! 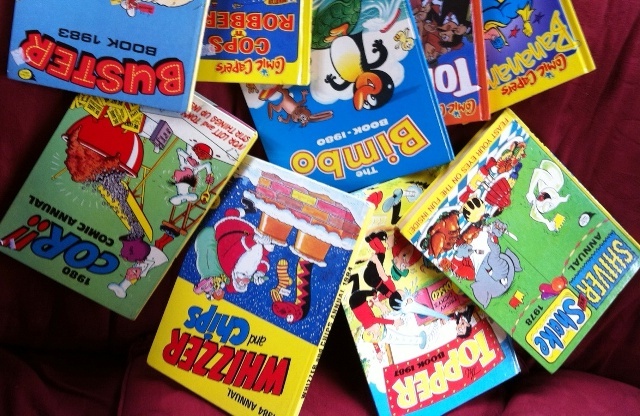 And the same goes for the Big Guys too – my daughter wrote to The Beano, explaining how the comic had helped her overcome her hatred of reading; and this actually led to an appearance on Radio 4 by the nipper – alongside fellow dyslexic Nigel Kennedy. Yup – nice, well brought up kids should say ‘thank you’, I reckon. And it should go without saying that – like the bigger and scarier inmates in prisons – the smaller inmates in Da Family simply adore receiving proper, old-fashioned letters in the post. Makes them feel like important, worthwhile little souls. And if a real-life writer writes back to you? Coolio Daddio. 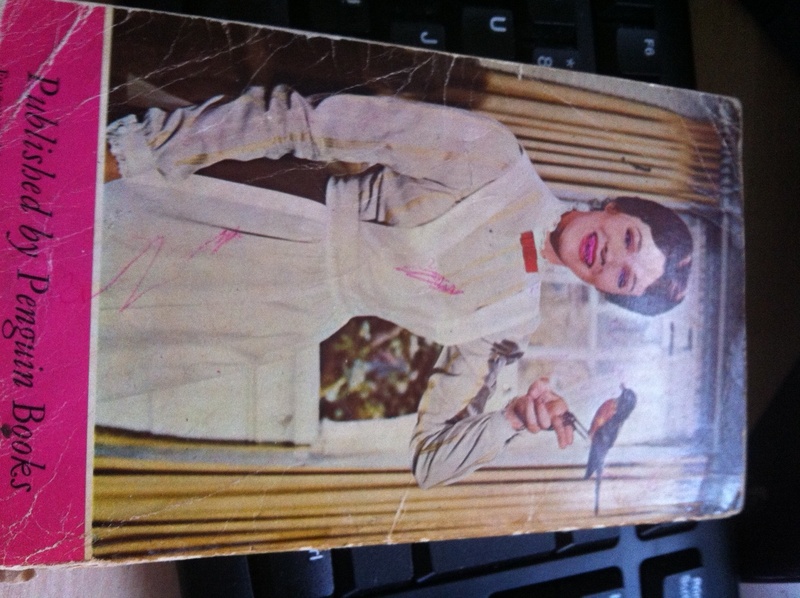 My ancient copy of ‘Mary Poppins.’ My cousin coloured Julie’s teeth in pink. Because the thing about a lot of kids and adults with dyslexia is this; they ain’t thick. Far from it. More of ours. So…Are you a ‘Buster’ – or a ‘Bimbo’ fella? 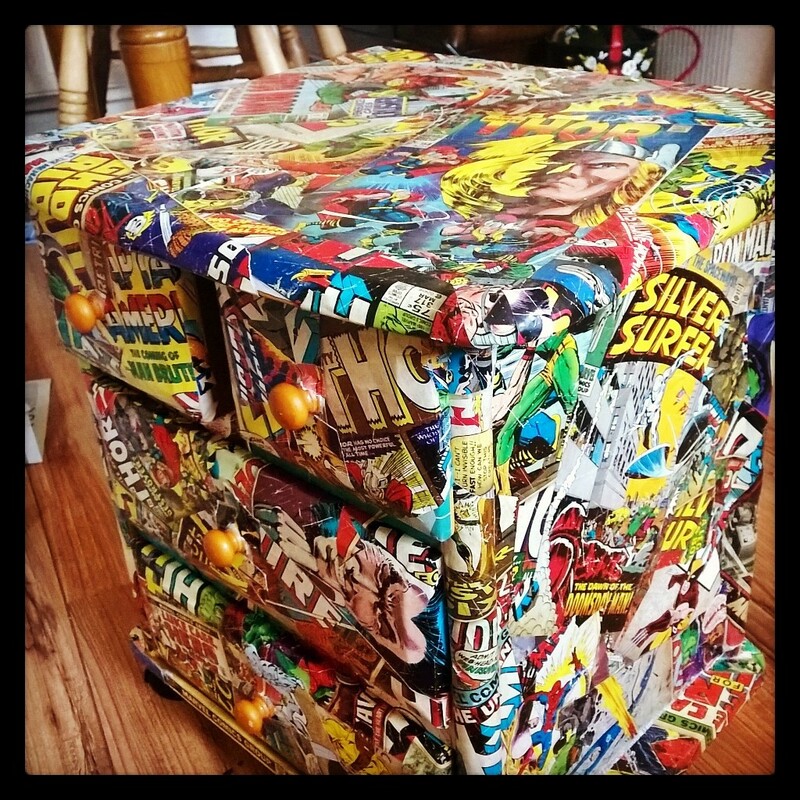 When the comic books get ripped – or if you just want to fill more time when the TV’s gone – you can upcycle a set of drawers. Here’s one I made earlier. Ace, innit? 8) KILL THE TELLY – I’ve said it before and I’ll say it again. The biggest enemy to the reluctant reader is excess screen time. Chuck the telly out of the window. And as well as providing you with more time to read, you can also fill all of the extra time that you will gain with the sort of project illustrated in this photo, instead. And if you *must* have a TV, don’t allow viewing on the week days. Please, believe me – this little act of discipline is one that you’ll simply suffer the pangs of short-term pain for, whilst reaping the benefits of long-term gain. It can be a LOT harder to bin the box when they’re under the age of 5 (and I personally don’t think that I could have done it, back then) but the minute that they’re able to read, go nuts on getting hold of second hand books! Let them lose on a pile of those instead of CITV or CSI. I now have to physically lock the room in our home, which houses our biggest collection of the most fun-to-read books (i.e comic/ annuals), if I ever want my kids to do anything other than read … and these days they rarely even think to ask me if they can watch the telly. Remember Roald Dahl’s poem on what TV does to your child? But, if you had told me that life would be like this three or four years ago, I would have smiled politely to your face and mouthed ‘yeah, right – you weirdo,’ behind your back. And my next blog will involve passing on some thoughts about how we can start getting a bit choosier about our reading material, whilst still supporting our libraries. Me: (distracted, as per usual): Sorry? Daughter: Yeah. I always remember it because it’s between my birthday and yours. And we were all told about this at school. IT’S ROALD DAHL’S BIRTHDAY THIS WEEKEND. Like …. it was the Queen’s birthday or summat! But way better. Obviously. Because Roald Dahl might not have been from Up North or that. But he wrote some really cool books for kids dinne? Me: Yep! He did. He was great! 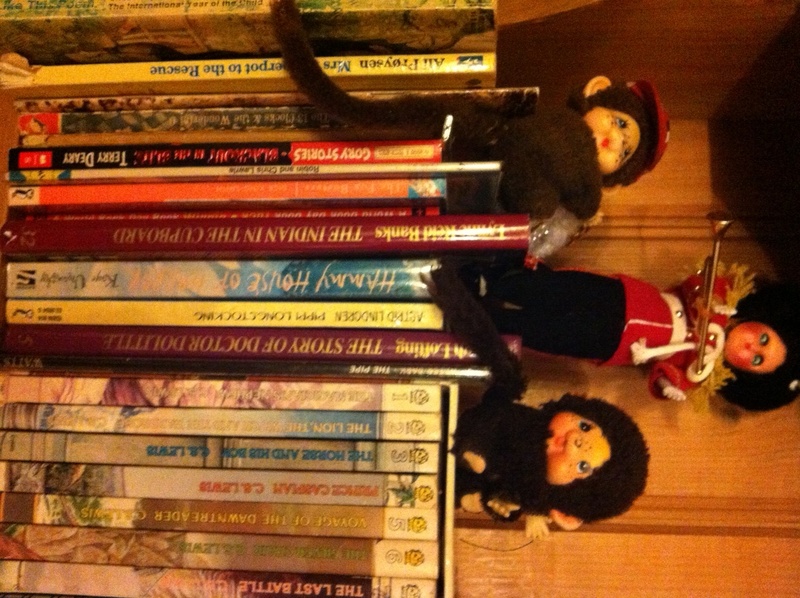 Daughter: And even that Little Weirdo [her smaller brother] is totally into Roald Dahl now. But that’s probably because Roald Dahl had this really spooky bit in his head where he wanted to freak us all out and talk about drowning kids in chocolate rivers and feeding kids on a big fat peach to seagulls. And that. Me: Well. He always had a dark edge to what he wrote. But his writing for children was never really that scary. Daughter: No. It was. Maybe just a bit. Like your book! ‘A Dark and Bleak Comedy’. That’s what it says. About your book. Like. we can all laugh at horrible things – because when people die – it can actually be really funny….! Daughter: Anyway. However that Roald bloke writes – our Stinkypants loves him. And he hasn’t ever EVER wanted to listen to any other books or stories before he heard ‘Danny The Champion’ – has he? And now it’s all Chocolate Factory and Giant Peach every day, isn’t it? Daughter: So you can’t blame any of us for wanting special treats today, ’cause it’s Roald Dahl’s birthday. 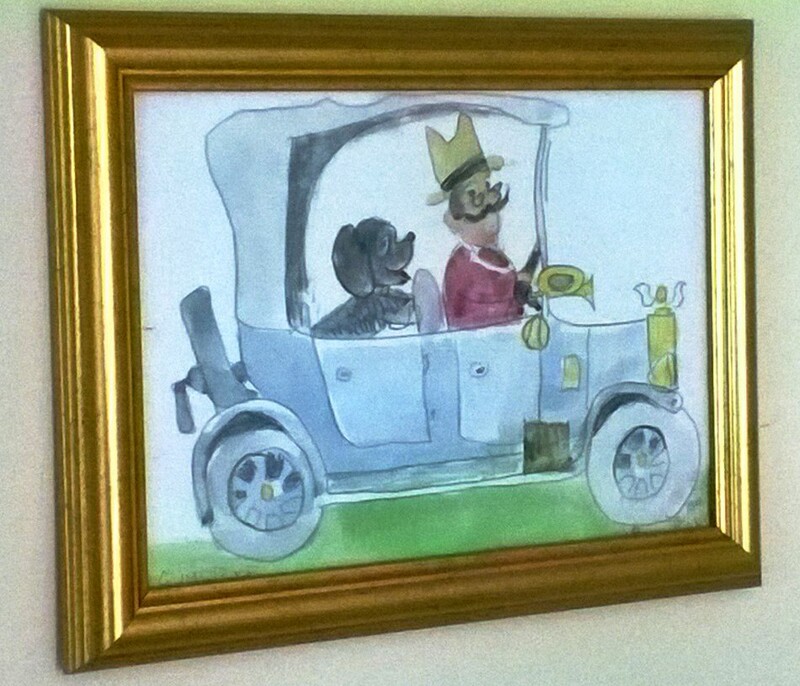 Get the Waggon Wheels out, I say! And we love books in our family and should celebrate it. ‘Cause the Queen never wrote nowt for us, did she? Daughter: Which is probably why the Scottish ones want to tell us in our England to get lost. If our royal people can’t write good stories and if that David Cameron expects me to pay for you – when you’re old and loony and in a home for nice but mad old people – Well. I wouldn’t want to be in our England government thing either. If I was a Scots One! Me: Hang on. We were talking about children’s books. Now you’re talking about Scottish independence. What on earth do you know about the referendum? Daughter: Lots. I hear what you grown ups are always saying. Like… the UK Fish-Kipper party people need to read cleverer newspapers. And that the Scottish fish Allie Salmon bloke needs to remember that we don’t actually HAVE to do all of the government and royal family thing in england. Lots of us here are already happy to burn down the Houses of Parliament. And we might do it in a few weeks!! Me: [appalled] Sorry – but where on earth did you hear that its okay to do that kind of thing? And if you’re talking about Guy Fawkes and the Gunpowder Plot – you’re talking about some of the earliest acts of terrorism in the UK! And how on earth can you think that such things are okay? Daughter: [irritated] Don’t blame me! It’s what our WhiffyPants told me he was learning at the Infants! So yeah… they’ll probably be reading their dark Roald Dahl stories there. And then they’ll be learning about how to blow up fleas on rats in a tunnel to kill the Umbolic Plague. 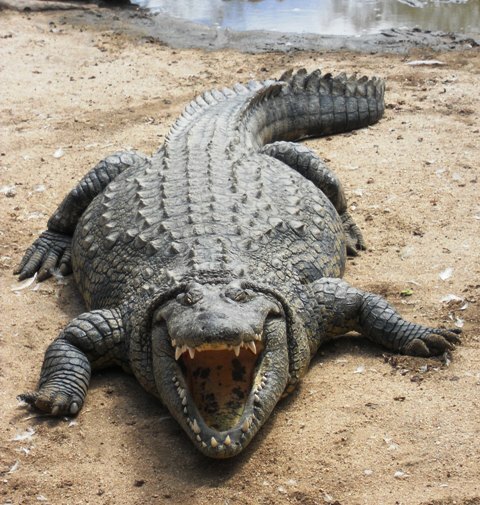 With one of Roald’s enormous crocodiles too. And then they’re also learning how to be exploding the bad government in a big Fire Of London. At the same time. That’s what Pongypants says he’s learning about. And then…to remember it all – this is where that making of a fake body of that Guy Fawkes religious bloke comes from. And this is why we – in England – chuck it on a bonfire. Daughter: Arghh! You just don’t understand! It’s something the government here just introduced! They told us about it at school! It’s called our new “NATIONAL CURRICULUM” We’re allowd to be independent and to celebrate our history, Mum!